In the era when the old traditions are becoming dust, when people start to forget their roots, when nothing is sacred, few souls desperately seek for reviving, and they look for the force to restore the pride of past generations. And the force was found in the image of Leidungr, a Sweden based project that was raised on the fertile soil of Puissance and Arditi. The project that was started by Henry Möller as a personal exploration of Swedish traditional folk elements grew up very fast to be something independent and mature enough to release the first album during the early 2013. The crew of three noble man joined forces for the album 'De Nio Kraftsångerna' (The Nine Power Songs) that found home on Equilibrium Music label, a natural choice for the product of such a quality. Mister Möller defines the music to be Nordic Ritual Folk, and I think it is a pretty close description of this record's content. While listening to this creation, one has to keep in mind the Nordic mythology and the energy that it cultivates for many centuries already. While I dig the information from the various sources, I become more and more infused by the spiritual background of the ancient times long gone. I started to draw the parallels from the very beginning, as soon as the cosmos in Norse mythology consist of Nine Worlds, it can be compared to the Nine Power Songs of Leidungr. All the stories are pompous and solemn, describing the heroic deeds of gods and men. Therefore, the music reflects the exact point while Henry's rich experience in martial industrial scene plays a truly important role. All the tracks of the album are very rich with the solemn orchestrations, choral samples, military rhythm drums and other components. The opening track "Nordisk Kult" breathes with a majestic spirit, anxious and tragic melody floats all around reminding the history full of battles and crusades. The same techniques are heard from "Principium Absolutae Primum" and "De Uråldriga", highly atmospheric and ritualistic tracks that are built around slow, creepy chanting. 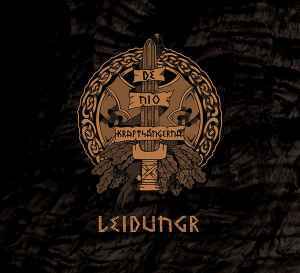 "Vindålder" reveals the whole gamut of Leidungr and explains clearly why the new project is different from what I've heard from Arditi in the past, when a huge portion of guitar riffs and different folk instruments are added to what should seem to be a straight martial music. With "Gudomlig Dådkraft" and "Urnord" the band focuses also on a medieval component of the whole structure concentrating efforts on bard violin passages. I cannot pass by the title track "De Nio Kraftsångerna", that is for my opinion the best composition on that CD being a very energetic and yet mysterious theme. One of the elements that connects this album to the industrial scene is a constant looping of melodies inside the specific track, the technique which is significant to that kind of music and adds a lot of magnetism by its hypnotic ambience. The music of Leidungr is soaked by northern mists, breathes with a chilling wind of icy plains, and smells with the rage and blood of heroic battles. A constant practice in rune magic helped the band to break the border of time continuum and reanimate the pride of epic centuries in the hearts of strong men. Wear your armor; take a sharp sword, a faithful companion of courageous deeds, and hail the legacy of ancestors with The Nine Power Songs. To be completely honest I find this album quite good into the standards of what Mr Möller has been done for 20 years now, he is now what we could call a master of the sampler machine, that impressive anti- musical instrument that any Dadaist would have killed for, giving the chance to create universes made with pieces made-by-others, a technique that in the past we could have called pastiches in literature or papier maché in sculpture, or simple collage with painting. In synthesis an ultra modern "instrument" that defies in itself all the emblematic and traditional use of any classical instrument whatsoever, which remains quite a paradox if we think about the context this work tries to remit us at, the most radical "blut und boden". And yes the generality of the music as usually ominous and cheerless tries to be heroic with the arch typical tactic of the bombast and clangour that Puissance and Arditi developed till the point of paroxism, only now adorned with (alas) more samplers akin with folk music and a subdued voice that narrates with somber tone meanwhile. So eventually we find not a musical evolution, but some sort of manic perfectionism given to the same thematic that has been the whole plot for 20 years, two decades for they to finally have achieved the perfect martial industrial pastiche, although it is too late to celebrate for both the genre and the doers. Where Möller has succeeded as all the rest of the martial industrial crew its in the way of meticulously dissecting the perfect set of atomic loops of classical and folk music that will later form entire sequences of melodramatic bombast. The intersection of sequences with the obsessive repetition familiar with industrial music grants this sort of ecstasy conducted by a robotic pathos, out of any humane emotion as any real classical music should do. And my critic to this kind of music is the same that Yukio Mishima did 50 years ago with his remarkbale clear ideal:"Unity of word and deed, searching for the harmony of pen and sword". Once again I perceive that Möller and Co doesnt apply this maxim, and thats why their music may be apparently strong, but their strength its impeded by their unability to understand things beyond the ideal. They are all wishes and dreams, but lack any sense of action or reality, their music lives in dreams and remains in dreams that transforms in heavy nightmares or deliriums. They moan and sob about an idealized past they didnt knew and while they do they step in their toes in a present they dont understand and are afraid to experiment or deal with, thus their weaknesses get evident in the last part of the album, in where they reveal all the moribund spirit not of the warrior "in man" as they try to symbolize metaphisically speaking, as the warrior "in man" doesnt dies as it is an ideal, and ideals doesnt die, only transform and adequate to historical circumstances. What is truly dying, and their music explicitly tells about its the idealization of a past gone, their intent to live into that past and their wish to bring back that past into this present, thats all the moribund feeling I detect in this music. The creations of Jünger, Mishima, Prokofiev were reflections about what they experienced in reality, not in idealized utopias either from past or future. They lived first, created later, and even though they partially praised the value of war as an experience for life it was merely a result of what they consequentially found as result of their practices and experiences, not merely their dreams and their wishes. I praise the value of both action and thought only when the two are paired, but in this case with Möller its always sided in favour of the ideal, of the abstract and the metaphysical ghost, in a sentence, "his music lives in a dream" or in a nightmare depending on who perceives it.